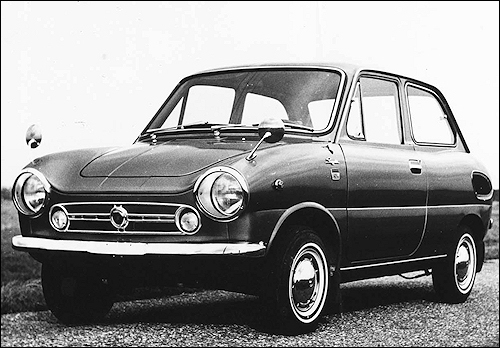 Suzuki Fronte SSS introduced in April 1970. Another facelift took place in April 1970, when the grille became more ornate and the sporting version was rebaptized "SSS". Marketing materials referred to this version as the "New Fronte". Two new engines of 31 and 34 PS were installed, while the original 25 PS version was discontinued. The more powerful version was installed in the Hi-Super DX and S versions. Production ended in October 1970, in advance of the succeeding "Stingray" Fronte 71. In June the Estate model was succeeded by the Suzuki Fronte Custom. The Custom has the same wagon body style but lack a top opening at the rear. While it received a new grille it came with a downwards opening trunk lid only. A more luxurious and powerful (30 PS, 110 km/h) Hi-Custom version was added two months later. 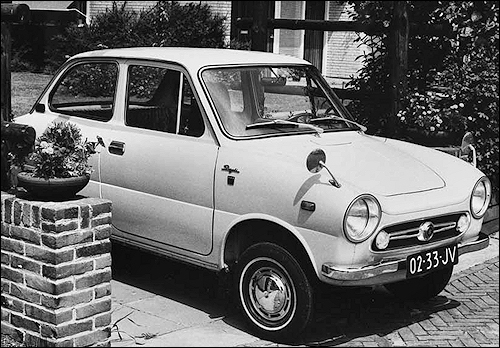 In November 1970, the third generation Suzuki Fronte 71 (LC10 II) two-door sedan was introduced. Its aggressive design was commonly referred to as the "Sting Ray Look". The rear-engined chassis design and engine remained the same as its predecessor the LC10, although with a slightly longer 2,010 millimetres (79.1 in) wheelbase. Other minor chassis differences were the addition of a front anti-roll bar and the change to a semi-trailing arm rear suspension layout. There were 31, 34 or 36 hp versions available, the lineup being topped by the S, SS, SSS and SSS-R (the letter "R" merely indicating the fitment of radial tires) versions. 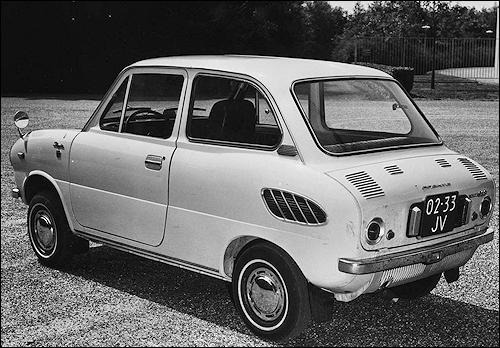 Suzuki in 1968 bought former Japanese automaker Hope Motor Company which in April 1968 had introduced fifteen small off-road vehicles called the HopeStar ON360. 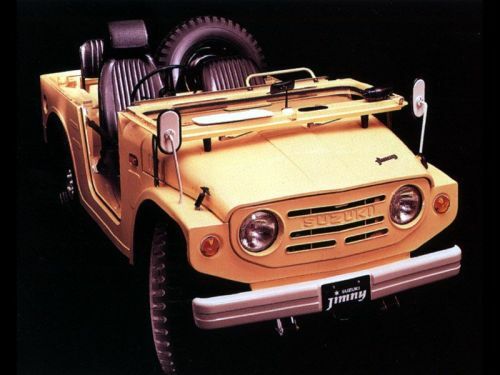 The first Suzuki-branded 4-wheel drive, the LJ10 (Light Jeep 10), was introduced in April this year. The LJ10 had a 359 cc air-cooled, two-stroke, in-line two-cylinder 25 PS engine. Since the new power unit is smaller than 360 cc, and Suzuki placed the spare tire inside the truck (making it a three-seater) to keep it under 3 meters in overall length, it was classified as a kei car, conferring certain tax privileges and other benefits. When it was introduced in April 1970 it was the first four-wheel drive kei car to enter series production. The LJ10 Jimnys has sixteen-inch wheels, weighs 590 kg (1,301 lb), and has a top speed of 75 km/h (47 mph).